Man, I lost my train of thought again. Um…yeah, so, anyway my husband and I schlepped our two kids to a tiny cottage on the lake up in New Hampshire for a few days to, as they say, “get away from it all.” A great idea in theory, of course. But in practice, leaving your house for even a small period of time with a toddler and a baby in tow is the opposite of relaxing. It’s basically spending all night getting kicked in the face by tiny feet (because, god forbid, they actually sleep in the bed provided for them) and spending all day hurling gallons of sunscreen at their back as they sprint toward the closest large body of water so they can eat sand and practice drowning. Huh? What..? It’s fine. Everything’s fine. Just sitting here trying to get some work done. Fantastic! Lovely day, isn’t it? Well, nice talking to you! I…sure. Nice talking to you. Random stranger. Alright, that’s it. What the hell is going on here? Can I help you with something, buddy? Huh? Oh, my apologies. Just trying to be friendly. Have a good afternoon! Trying to be friendly? Well who the hell does that? See, it’s just like I was saying, going on vacation exposes who you really are. 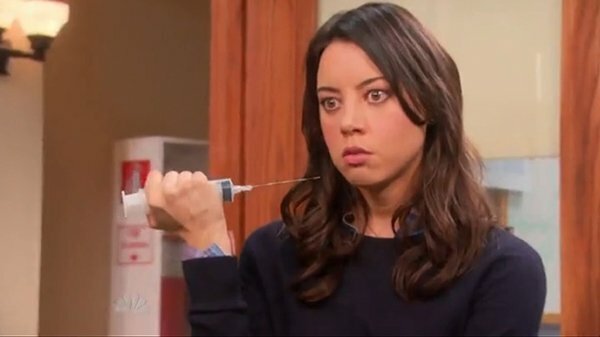 And someone I truly am is apparently someone who has lived in a city for too long and is now just super rude and glares at everyone who smiles at me with my best April Ludgate impression. Only it’s not really an impression anymore so much as it is just my face now. Because we have apparently ended up in the world’s friendliest town and I am confused and angered by this tendency of people to be overly nice even though I used to BE one of these people when I was growing up in a small town. But I have now forgotten how basic human decency works. Meanwhile, my husband, within 30 seconds of arriving here, reverted back to his old, friendly, Midwestern roots as easily as breathing. I think I even heard him blurt out “howdy” at one point. Oh, excuse me, ma’am? You forgot your purse. Here you go. Oh, and so you just thought you’d give it back to me? Without stealing my money or anything? Of course. Well, thank you, Mr. Nice Friendly Man. And sorry I sound so sarcastic. I am actually very grateful. But I just realized I am a horrible, rude, human pile of garbage. Have a nice friggin’ day. This entry was posted in Family, funny, Holidays, Humor, Travel and tagged april ludgate, family road trips, friendliest natives, humor, new hampshire vacation, resort towns, rude city people, vacationing with small children, why are people talking to me, wolfeboro. Bookmark the permalink.